Last Friday Harding Stowe, the owner of Brooklyn Kava, stopped by the Gizmodo offices to offer us a sample of kava tea—a tea so potently relaxing people have been said to have driven off roads after drinking it. I didn’t drive off a road, but I did forget to file my story! It was a little unnerving being a white woman and being introduced to kava tea by a white man, because historically, it is not a white people drink. Kava tea is a popular drink consumed throughout Oceania, and a cash crop in Fiji (Brooklyn Kava gets its tea from there). In some countries, like Tonga and Samoa, it has cultural importance outside of its mind-altering qualities. While in other nations, like Fiji, it’s just really damn popular. In the US it’s gaining ground because the government hasn’t banned it and because one bitter cupful will get you really stoned. 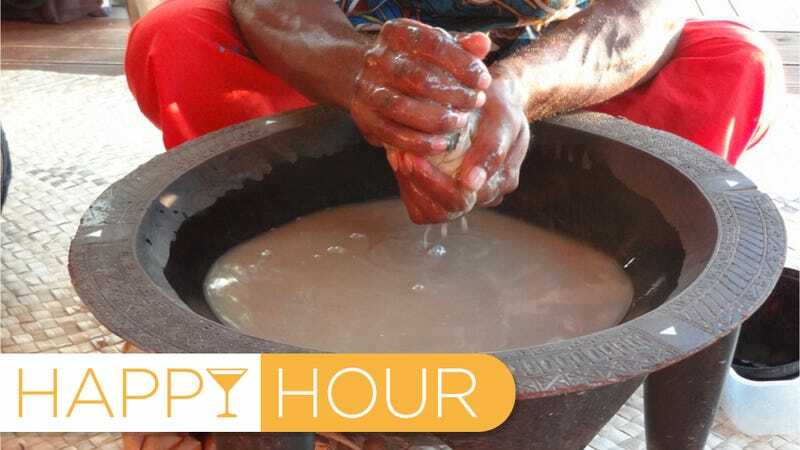 The tea is produced by soaking kava roots in cold water and then squeezing the heck out of them, usually after wrapping them up in a cheesecloth. The kava juice mixes with the water to create the bitter brew, which is traditionally knocked back like you’re doing giant shots. How stoned does it get you? I’m told you can see me grow progressively more mellow over the course of this video (yes, my parents are both very proud), and a co-worker hopped in after the shoot, had half a cup and then spent the next hour staring vacantly at her computer screen. Personally, I just felt great for a couple of hours. It was similar to the effects of a very mild cannabis edible. Deadlines and concerns still existed, but distantly, and all I really wanted to do was lay on a couch and re-watch all of Stranger Things. The taste leaves something to be desired. On its own Kava tea is extremely bitter; think coffee coldbrew concentrate. The bitterness rests squarely on the sides of your tongue and only disappears as the numbness takes hold, because yeah, Kava tea induces numbness. It’s fleeting and the degree of numbness depends on the person. I barely noticed it while my colleague briefly sounded like she’d just been to the dentist. Brooklyn Kava is trying to make up for the bitter flavor and numbness by embracing mixology. The bar offers a variety of drinks that mask the taste without messing with the effectiveness of the tea. The drink I tried was made of Kava concentrate, lemon, honey, and crushed mint. It was immediately refreshing, though there was just enough bitterness still on my tongue from my previous drink to bring to mind the flavor of bile. So maybe don’t mix your regular Kava tea with the mixed drinks. Also, if you’re currently on medication for anxiety or depression, be very careful and consult your doctor first. Kava tea’s psychoactive properties hit the same bits of your internal chemistry that anti-anxiety and depression medications hit. It’s the same reason that Brooklyn Kava does not recommend mixing Kava tea with alcohol. One mind altering substance should be enough.